「원조오잠(元朝五箴)」은 회재(晦齋) 이언적(李彦迪)이 27세 때 지은 「외천잠(畏天箴)」, 「양심잠(養心箴)」, 「경신잠(敬身箴)」, 「개과잠(改過箴)」, 「독지잠(篤志箴)」을 퇴계(退溪) 이황(李滉)이 읽고 크게 감명을 받아 평소 잊지 못하여 오던 중 이언적의 아들 이전인(李全仁, 호(號)는 잠계(潛溪), 1516~1568)의 요청에 의하여 쓴 것으로 전하고 있다. 이러한 내용은 10폭에 적혀 있는 이황의 발문에 보이는데 여기에는 잠계 이전인의 요청에 의해서 썼다는 기록은 없고 끝에 ‘후학 이황 근서(後學 李滉 謹書)’라고 쓴 묵적이 선명히 남아 있다. ‘원조오잠’은 퇴계가 회재의 학문과 사상을 어떻게 보고 영향을 받았는가 하는 점을 친필로 남겼다는 점에서 중요한 가치가 있다. 「원조오잠」은 광폭의 닥종이에 매폭 6행(行), 1행 16자(字), 자경(字徑) 약 8㎝ 해서(楷書)로 쓴 것이다. 발문은 4행(行), 자경 약 4㎝ 미만의 해행서체로서 글씨는 분방하거나 과장된 또는 거칠거나 연미한 필서가 전혀 없고, 단중전아(端重典雅)하여 순정한 원칙을 지키는 도학자의 풍모가 그대로 투영된 대표적 유묵(遺墨)이라고 할 수 있겠다. 퇴필(退筆)의 특징은 송설체(松雪體)의 유려한 필법 위에 왕희지 부자의 굳세고 단정한 필법을 보탠 것이라고 김인후는 전별시에서 언급하였는데, ‘원조오잠’은 이러한 퇴묵(退墨)의 전형적인 예에 속한 것이다. 이언적은 1530년 이안로(金安老)의 등용을 반대하다가 좌천되자 관직을 그만 두고 귀향한 뒤, 이듬해 자옥산 기슭에 독락당(獨樂堂) 등의 옥산정사를 짓고 주위의 승경(勝景)을 명명하였다(소위 ‘사산오대’). 이들 글씨는 그중 자옥산(紫玉山)ㆍ용추(龍湫)ㆍ귀영대(歸詠臺)ㆍ징심대(澄心臺)ㆍ세심대(洗心臺)ㆍ탁영대(濯纓臺)ㆍ관어대(觀魚臺) 7곳의 명칭을 대자(大字)로 써서 축장(軸粧)한 것들로, 회재의 아들 이전인(李全仁)이 ‘원조오잠’의 글씨를 받을 때 이 대자 편액서도 함께 받은 것으로 추정된다. 퇴계의 대자서(大字書) 편액(扁額)은 도산서원의 「역락서재(亦樂書齋)」, 안동(安東) 광산김씨(光山金氏) 예안공(禮安公) 종택(宗宅)의 「후조당(後彫堂)」, 「읍청정(挹淸亭)」, 도산의 「월천서당(月川書堂)」, 예천의 「선몽대(仙夢臺)」 등 대표적인 것이 많다. 그러나 서각(書刻)을 한 편액은 존재해도 그 원본의 필적이 다 전하는 것은 아닌데, 독락당의 ‘사산오대’는 대자 편액서가 고스란히 전한다는 점에서 큰 가치가 있다고 할 것이다. Yi Hwang was greatly moved by the books written by Yi Eon-jeok at the age of 27: Oecheonjam, Yangsimjam, Gyeongsinjam, Gaegwajam, and Dokjijam. With Yi Hwang unable to get over such strong impression of the books, Yi Jeon-in (1516-1568, pen-name: Jamgye), Yi Eon-jeok’s son, asked him to write the Original Five Admonitions. Such request by Yi Jeon-in can be inferred from Yi Hwang’s epilogue on page 10, even though the text does not say explicitly that he asked him to write it. Meanwhile, the words “huhak Yi Hwang geunseo” clearly remain at the end. This document is meaningful since it is a monumental text handwritten by Yi Hwang who elaborates on what he thought of Yi Eon-jeok’s academic achievements and ideas and how he was influenced by them. This document was written in haeseo style on wide mulberry paper, with six lines per page and sixteen 8cm-characters per line. The epilogue was written in haehaengseo style in 4 lines, with characters measuring less than 4cm. With its neat and pure writing style of a moralist that is far from being free, exaggerated or rough, it is one of Yi’s most representative posthumous works showing Yi Hwang’s typical writing style, which combines the elegant Songseol style and the firm and neat style of Wang Xizhi and his son as Kim Inhu mentioned in his farewell poem. ○ Four Mountains and Five Rocks: When Yi Eon-jeok was demoted after protesting the appointment of Yi An-ro in 1530, he returned to his hometown the next year and built detached houses including Dongnakdang House at the foot of Mt. Jaok. There, he named the scenery “Four mountains and Five Rocks,” which include Mt. Jaok, Yongchu, Gwiyeongdae Pavilion, Jingsimdae Pavilion, Sesimdae Pavilion, Takyeongdae Pavilion, and Gwaneodae Pavilion, and wrote these in large letters on a decorated scroll. 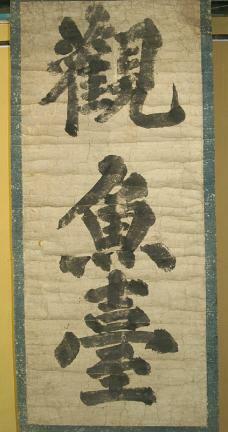 Yi Jeon-in, son of Yi Eon-jeok, apparently received this calligraphy together with Yi Hwang’s “Original Five Admonitions.” Yi Hwang’s tablets written in large letters have been found in many places, including Yeongnak seojae at Dosanseowon Confucian Academy, Hujodang and Eupcheongjeong at the head house of Yeangong of the Andong Family of Gwangsan Kim’s clan, Wolchun seodang of Dosan, and Seonmongdae of Yecheon. Considering the fact that the engraved replica tablets do not include the entire original penmanship, the tablet of “Four Mountains and Five Rocks” at Dongnakdang House is valuable because it has been kept intact in its entirety.